Beames Dreidel is made with pewter and fused glass. 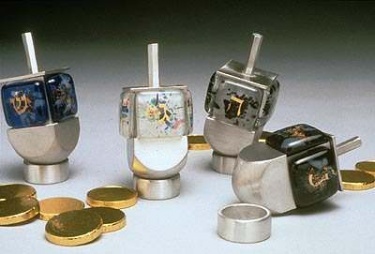 Each Dreidel is one of a kind. Dreidels are available in Fiesta White, Cosmos Blue and Galaxy Black. Sara and Michael Beames, of Beames Designs, combine the ancient art of fused (kiln fired) glass with cast pewter. aluminum, and wood, to create contemporary, yet, classic, elegant home accessories and Jewish ritual objects. Beames Designs work can be found in galleries and craft shops throughout the United States, as well as in Japan, Hong Kong, England, South Africa and Australia.